If I didn’t know you wanted more than one word from this review, I’d simply say, “Wow!”. But that doesn’t tell you much, does it? This is Book One of the Kaely Quinn Profiler series and centers around an FBI profiler with an odd history and equally odd personality. Although the publisher calls it romantic suspense, this is not your typical novel in the genre—many of which have become pretty cookie cutter. This book is both intriguing and disturbing as a serial killer forces Kaely to confront a past she’s tried over the years to rise above. I can’t say the villain was a total surprise, because no one would have been a surprise. Ms. Mehl creates enough in the way of rabbit trails, red herrings, and suspects to keep the reader guessing, never completely certain of the answer. As for the romance, it is typical of the author—there but subdued. Noah Hunter, a new agent for the St. Louis FBI office is tasked with working the case with Kaely. It’s an assignment that doesn’t make him happy. She’s a lone, odd duck with few friends and supporters among those in the office. I did find the depth of his attraction to her a bit sudden. However, that attraction wasn’t originally there. In Noah’s wildest dreams it would have never occurred to him that he would be the next agent assigned to her. Most of the other agents snickered behind her back, calling her Jessica Elephant. Not just because they knew her history and her real name but also because once she saw a crime scene she seemed able to recall everything—even down to the smallest detail. Maybe she had some all-consuming desire to rid the world of killers like her father, but that wasn’t Noah’s problem. 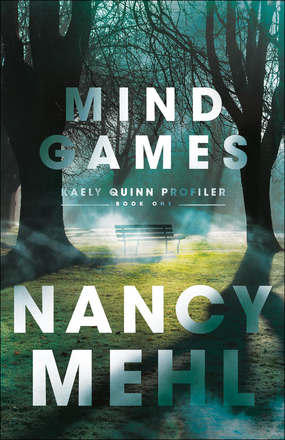 I highly recommend Mind Games for those looking for something a little different from their romantic suspense! And I’ll be waiting for the next book, Fire Storm, to arrive in August.